Home Yu-Gi-Oh! Yu-Gi-Oh! 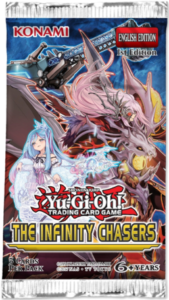 Featured Writers The Infinity Chasers – What You Should Know / Yu-Gi-Oh! The Infinity Chasers – What You Should Know / Yu-Gi-Oh! Infinite possibilities. Hello Pojo Readers, Crunch$G back here with the next “What You Should Know” article, this time being on The Infinity Chasers. In this set, we have three new archetypes: Infinitrack, Witchcrafter, and Evil Eye and each have their own strategy. 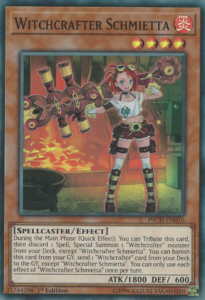 Infinitrack is an Xyz based deck, Witchcrafters are focused around Spells, and Evil Eye use a certain Equip Spell to gain extra, more powerful effects with some downsides. Each of these archetypes are bringing something new and different to the table, so it’ll be interesting to talk about them and see how good they are and maybe see how versatile these archetypes are, so without further adieu, let’s get straight into the discussion about The Infinity Chasers. The first archetype is the Xyz based Infinitrack archetype, an archetype full of EARTH Machines that are supposed to help you Xyz Summon. The lower level monsters help combine levels to make Xyzs and the Level 5s sacrifice EARTH Machines to get onto the field. Infinitrack Harvester is a Level 2 that searches for an Infinitrack monster from the deck upon summon and once per turn can target another EARTH Machine you control and both that monster and this monster’s levels become equal to the combined levels of both. Anchor Drill is a Level 4 that upon its summon can summon any EARTH Machine from your hand in Defense Position and has the same level modulation effect as Harvester. 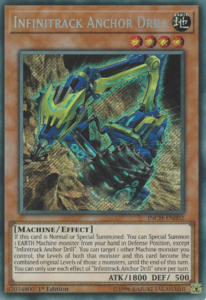 Crab Crane is the first Level 5 that can Special Summon itself from the hand by tributing any EARTH Machine, which all the Level 5 Infinitracks have this effect for future reference, and once per turn can let you banish a Machine in your graveyard to search for an Outrigger Extension, which is a Continuous Spell that protects Xyzs you control from targeting and once per turn can take an Infinitrack Xyz and let you Special Summon a Machine Xyz with two Ranks higher from your Extra Deck, but for the rest of the turn will lock you to EARTH Machine summons. 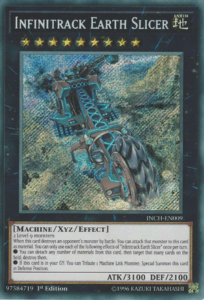 Drag Shovel is another Level 5 that can banish a Machine in your graveyard to search for Spin Turn, a Normal Trap that can change an EARTH Machine Xyz from Attack to Defense Position in order to destroy a monster your opponent controls or a EARTH Machine Xyz from Defense to Attack Position to destroy a Spell/Trap your opponent controls. Trencher is a Level 5 that can banish itself from the graveyard to Special Summon any Level 5 or lower Infinitrack from your graveyard, and Tunneller can banish itself from the graveyard to shuffle 5 EARTH Machines from your graveyard into the deck to let you draw 2 cards. The Infinitrack obviously has Xyz monsters, three of them to be exact, that attaches any monster it destroyed by battle to it as Xyz Material and can tribute a Link Monster to revive itself in Defense Position, but they have unique effects as well. River Stormer is a Rank 5 that needs 2 Level 5 monsters and can detach a material once per turn to take an EARTH Machine in your deck and add it to your hand or send it to the graveyard. Mountain Smasher is a Rank 7 that needs 2 Level 7s and can detach a material once per turn to gain 1000 ATK. Earth Slicer is a Rank 9 Xyz that can detach any number of materials from itself once per turn to destroy an equal number of cards your opponent controls. 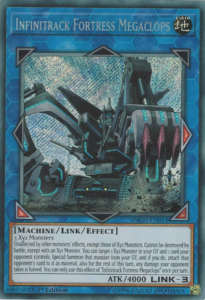 Infinitrack Goliath is a Link-1 with a Bottom Right arrow that needs any non-Link Infinitrack monster and when it is sent from the field to the graveyard, it’ll attach itself to an Xyz monster you control and give it protection from being destroyed by card effects just as long as said Xyz has the original typing of Machine. Infinitrack Fortress Megaclops is a Link-3 that needs 3 Xyz Monsters as Link Material and it has Bottom Left, Bottom Right, and Right arrows, is unaffected by effects of monsters that aren’t Xyz monsters and can’t be destroyed by battle except by Xyz monsters, and once per turn you can target an Xyz monster in your graveyard and a card your opponent controls to revive said Xyz monster and attach your opponent’s card to the revived Xyz monster as material but for the rest of the turn all damage your opponent would take is halved. The next archetype is the Witchcrafter archetype, which is a Spellcaster based archetype that is reliant on Spell cards. 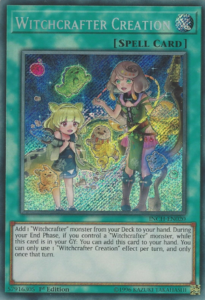 All of the Level 4 or lower monsters can tribute themselves and discard a Spell during either player’s turn to Special Summon a Witchcrafter with a different name from your deck, but they also come with unique effects. Potterie is a Level 2 that can banish itself from your graveyard when you have no cards in your hand to add a Witchcrafter card in your graveyard to your hand. Pittore is a Level 3 that can banish itself from your graveyard to let you draw a card then send a Witchcrafter card from your hand to the graveyard or banish your entire hand if you can’t. Schmietta is a Level 4 that can banish itself from the graveyard to send a Witchcrafter card from your deck to your graveyard. These lower level Witchcrafter monsters are made to get out the higher leveled ones with great ease, which all have their own unique effects. Edel is a Level 5 that can let you discard a Spell during either player’s turn to Special Summon a Witchcrafter from your hand or during your turn you can tribute it to Special Summon any Spellcaster in your graveyard that isn’t Edel. Haine is a Level 7 that prevents your opponent from targeting other Spellcasters you control with card effects and once per turn during either player’s turn can let you discard a Spell to destroy a face-up card your opponent controls. Madam Verre is the Level 8 boss of the deck that when your Spellcaster battles an opponent’s monster, then once per turn you can reveal any number of Spells in your hand to boost your Spellcaster by 1000 ATK and DEF points per Spell until the end of this turn and during either player’s turn, Verre can let you discard a Spell to negate the effects of all face-up monsters your opponent currently controls until the end of the turn. Now, the Witchcrafter Spells that aren’t their Continuous Spells can all grab themselves back to your hand at the end of your turn as long as you control a Witchcrafter monster and you didn’t activate the other effect of said Spell in the turn. Creation is a Normal Spell that adds a Witchcrafter monster from your deck to your hand. Holiday is a Normal Spell that revives a Witchcrafter monster in your graveyard. Collaboration is a Normal Spell that lets you target a Witchcrafter monster you control to let it make a second attack during the Battle Phase that turn and when it attacks that turn it’ll lock your opponent from using Spell/Trap cards until the end of the damage step. Draping is a Quick-Play Spell that lets you target Spells/Traps your opponent controls up to the number of Witchcrafter monsters you control and return them to the hand. 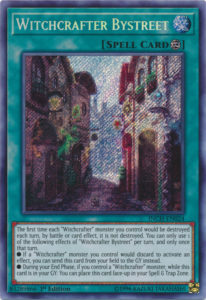 Now the Continuous Spells of the Witchcrafter archetype are different from the rest as while they’re on the field then they can be sent to the graveyard instead of discarding a Spell if you would activate the effect of a Witchcrafter monster that would discard a Spell and during your End Phase if you control a Witchcrafter monster and they are in your graveyard, then you can activate them from the graveyard, but both of them each have their own unique trait. Bystreet protects your Witchcrafter monsters from the first time they would be destroyed that turn and Scroll once per turn lets you draw a card when a Spellcaster you control destroys an opponent’s monster in battle. Masterpiece is the lone Normal Trap of the archetype that while you control a Witchcrafter monster, then you can target a Spell in either graveyard and add a Spell with the same name from your deck to your hand and you can banish Masterpiece from your graveyard along with any number of Spells, except the turn Masterpiece is sent to the graveyard, to Special Summon a Witchcrafter from the deck with a Level equal to the number of Spells you banished. 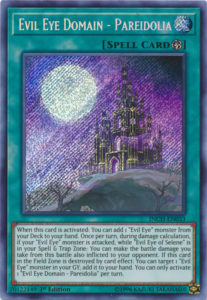 The final archetype in this set is the Evil Eye archetype, which is all based around the Evil Eye of Selene, an Equip Spell that can only be equipped to an Evil Eye monster, gives the equipped monster protection from being destroyed in general and protection from being targeted by card effects, when you activate an Evil Eye Spell/Trap card or the effect of the Evil Eye monster that Selene is equipped to makes you take 500 damage to boost the monster’s ATK by 500 even after Selene leaves the field, and if Selene is in your graveyard then you can pay 1000 life points and banish an Evil Eye Spell/Trap from the graveyard to reset Selene. Now that you know the heart and soul of the archetype, I can get to the rest of it all. 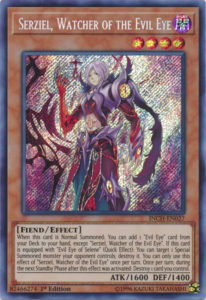 Serziel, Watcher of the Evil Eye is a Level 4 that upon Normal Summon searches for any Evil Eye card that isn’t another Serizel, and while it is equipped with Selene then once per turn during either player’s turn you can target a Special Summoned monster your opponent controls and destroy it, but during the next Standby Phase after you use that effect you must destroy a card you control. Medusa, Watcher of the Evil Eye is the other Level 4 that grabs an Evil Eye card out of your graveyard upon Normal Summon just as long as it isn’t another Medusa and while Medusa is equipped with Selene then you can banish a card from your opponent’s graveyard once per turn during either player’s turn, but during the next Standby Phase after that effect is used you must banish a card in your graveyard. Catoblepas, Familiar of the Evil Eye is a Level 3 that lets you target an Evil Eye Spell/Trap you control and until the end of the next turn, the first time it would be destroyed it isn’t, and if Catoblepas is in the graveyard and you control an Evil Eye monster then you can revive it from the grave but banish it when it leaves the field. Basilius, Familiar of the Evil Eye is another Level 3 that can Special Summon itself from the hand if you control an Evil Eye monster and once per turn can let you send any Evil Eye Spell/Trap from your deck to the graveyard. Zerrziel, Ruler of the Evil Eyed is the Link-3 of the archetype that needs any 2+ Evil Eyes as material, has Up, Bottom Left, and Bottom Right arrows, if it was summoned using a monster with 2600 or more ATK then it can attack twice, and if it is equipped with Selene then once per turn during either player’s turn you can target a card your opponent controls and destroy it, but during the next Standby Phase after that effect is used you must negate the effects of a monster Zerrziel points to. 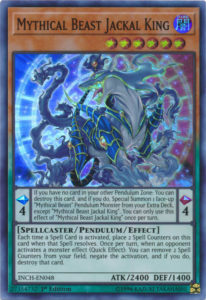 Evil Eye Domain – Pareidolia is the Field Spell for the archetype that can search for any Evil Eye monster upon activation, if an Evil Eye monster you control battled while Selene is in your Spell/Trap zone then your opponent can take the damage as well as you once per turn, and if Domain is destroyed by a card effect while in the Field Zone then you can grab any Evil Eye monster out of your grave and to your hand. Evil Eye Awakening is a Normal Spell that can let you Special Summon an Evil Eye monster from your hand or graveyard, or if you control Selene then you can summon one from the deck. Evil Eye Confrontation is a Quick-Play Spell that if you control an Evil Eye monster then you can target a Spell/Trap your opponent controls and destroy it, or if you control Selene then the destroyed card is banished instead. Evil Eye Repose is a Continuous Spell that upon activation can let you banish an Evil Eye card in your graveyard to draw a card, once per turn after damage calculation if your Evil Eye monster equipped with Selene battled an opponent’s monster than your opponent’s monster is banished, and if Repose is destroyed in the Spell/Trap zone then you can target 3 of your banished Evil Eye cards and return them to the graveyard. Evil Eye Defeat is a Normal Trap that if you control an Evil Eye monster, then you can target a monster on the field and return it to the hand or if you control Selene then you can instead target up to 2 monsters. 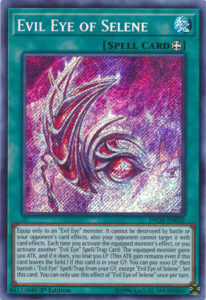 Evil Eye Mesmerism is a Continuous Trap that when your opponent Special Summons a monster in Attack Position while you control an Evil Eye monster with higher ATK then the Special Summoned monster, you can take control of that monster and while you control Selene then that monster becomes an Evil Eye monster. 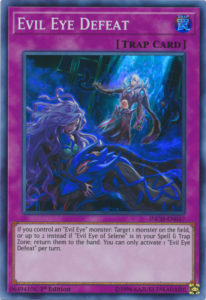 Evil Eye Retribution is a Counter Trap that if your opponent activates a Spell/Trap card while you control an Evil Eye monster, then you can negate the activation and destroy it and if you control Selene then the activation of this card cannot be negated. As with all these sets, we have some reprints worth talking about, which all reprints are in Super Rare. Juragedo is a nice reprint in holo once again. Hidden Armory gets its first mass printing since the Structure Deck it was in long ago. 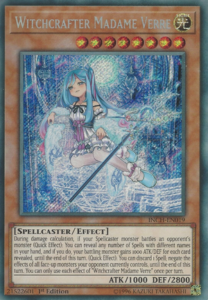 Secret Village of the Spellcasters will be nice for budget players to finally get a holo form of. Rank-Up-Magic Astral Force makes for a good reprint in holo. Heavy Freight Train Derricrane gets a long overdue holo reprint. Mythical Beast Jackal King gets a budget reprint that it desperately needed ahead of the Spell Counter based Structure Deck. Arcanite Magician is nice to see in Super Rare once again. Digvorzhak, King of Heavy Industry is nice as it’s the second reprint it has received now beyond it being a prize card. 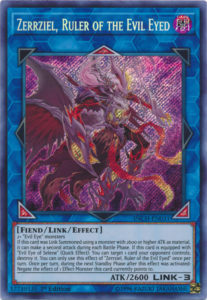 Mecha Phantom Beast Dracossack gets its first reprint in 5 years, same for Phantom Fortress Enterblathnir and that card is getting its first holo print. Wonder Wand makes for a nice reprint in foil. It’s nice to see Magician’s Left and Right Hand get a foil print. Spellbook of Knowledge is a good reprint to make it more budget friendly. Finally, I’m sure many people love a foil Magic Cylinder reprint. This might be one of my favorite “Deck Build Pack” sets we’ve seen so far as each of the archetypes have enough versatility to be mixed with other strategies. Infinitrack can go well with most Machine decks, especially EARTH Machine decks. Witchcrafter can work with a ton of different Spell strategies like Spellbooks or Bamboo Swords and maybe something like Lightsworns or Shaddolls work as well for those low level monsters and Spells. Evil Eye is a nice control deck that can work well with other control strategies I’m sure, El Shaddoll Winda comes to mind to work with this deck. These decks can be good pure or mixed with something else, and I’m sure players can find that sweet combination to find something successful out of this set, so I think it’s a well designed set overall, even if it doesn’t break the meta right now, cause it seems each of these archetypes will see more support.